Thanks to hard work from all the team and a special focus on managing problems logged by our clients, we've just received our hard-won ISO9001:2008 certificates for another year. 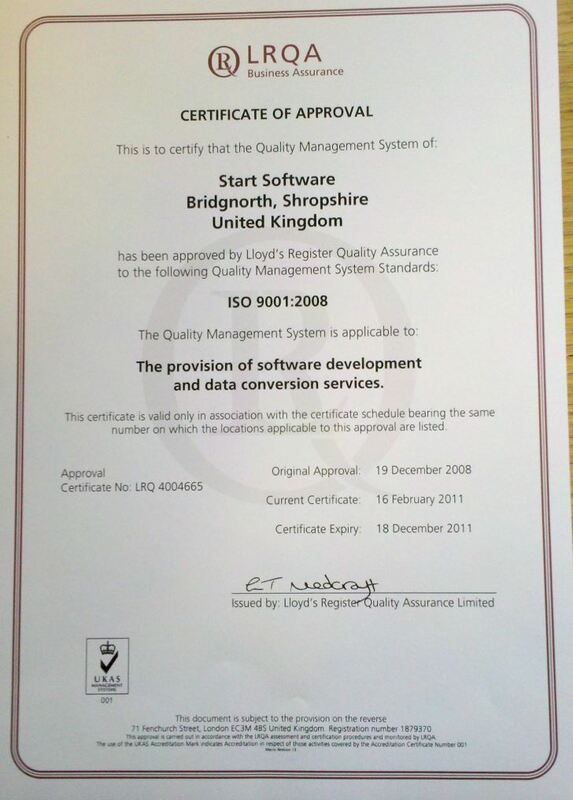 The certification covers software development and data conversion services in both our Bridgnorth and Telford offices. Congratulations are due to Kim and Elaine especially for their hard work and focus on quality (Kim) and customer service (Elaine). Major upgrade to Pocket PC Creations aka "Mobile Data Studio"
We have been partners with an Australian software company for many years now, using their pocket PC "framework" for our systems which collect and transmit data from users on site. The system we use - "Pocket PC Creations" - has now received a major upgrade and is now called Mobile Data Studio. Many new features we have requested are present in the new system and we will be in touch with all existing users shortly to let you know how you can benefit. Andy Couch is one of the UK's leading Access and SQL Server developers and is a regular speaker at Microsoft events. I met Andy at the Access User Group when we were both giving presentations and he has worked with Start Software over the last few months offering us his expertise on various technical matters. I'm delighted to announce that Andy will be working more closely with us over the next few months on a major development project. We're thrilled that we've been able to secure more of Andy's time and we're looking forward to working with him. PS What's does "MVP" mean? Most Valued Professional - a real accolade from Microsoft. We've just completed the work needed for a long-requested facility in Tracker - the option of saving Outlook emails into Tracker folders. If you are trying to store all project- or client-related information in Tracker, the problem has always been "what do we do with information which has been emailed in?" It is possible to manually save emails into Tracker folders but that is a bit of a pain whereas a slick method might encourage staff to share information more readily. The solution has been to develop a new button on the Tracker client and project forms which can "read" the currently open email in Tracker and save the contents directly to the relevant Tracker folder. It can even scan the whole of your Inbox looking for emails which mention Tracker project numbers, saving a batch of emails at one time. If you would like this update (it is free of charge to all Tracker customers with an active support agreement) please contact Elaine at the office as usual. Adam has just finished an upgrade to Resource Tracker (v1.0.457) which uses Google Maps rather than Microsoft's MapPoint DLLs for the integrating mapping facilities. This will ensure that the maps and directions used within Resource Tracker are the most up-to-date possible. If you are interested in this upgrade (which is free to all support/maintenance contract customers) please contact the office. 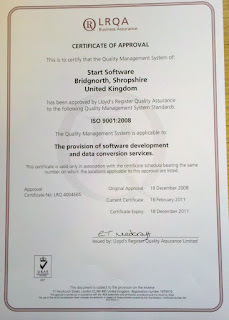 2011 has started off with a record performance from the support team at Start Software. 95% of high priority calls taken in January were resolved in time. Across all calls, 187 in total, more than 85% were resolved on time. Customers set their own target resolution times and so this performance is especially pleasing. With our ISO9001 review coming up next week, these are great statistics with which to demonstrate our customer focus.